Though we have a tentative goal to get Heart to the Blackwater ride as well Susan and I are just not certain if she will get there or not. She’ll ride on the trailer. Yes- I can get her on, but she doesn’t like the confinement of having the divider in and I have not yet closed the door on her in there. Susan feels comfortable riding her solo. 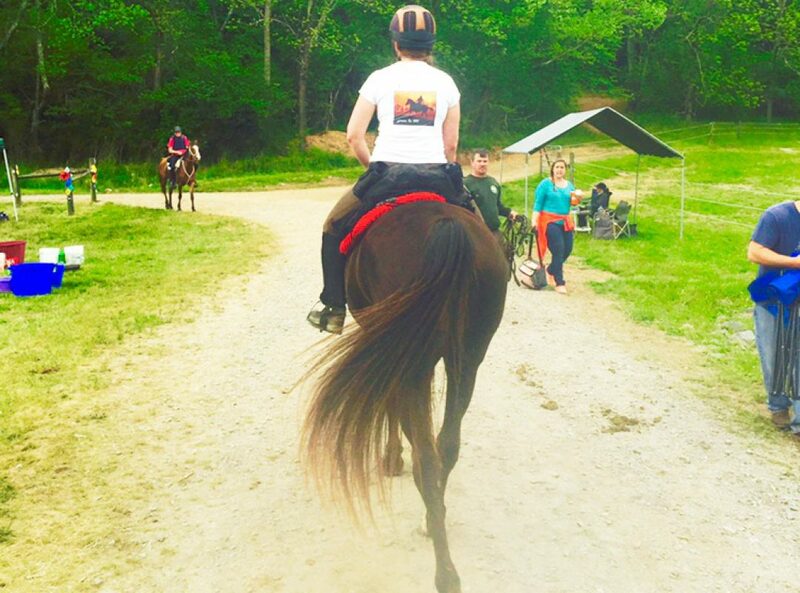 Susan rides alone in the arena, and hand walks her on the trails solo but the solo ride is still in the works. She understands and accepts electric fence confinement. It’s not impossible these requirements will be met, but it’s not a given- especially the trailer. 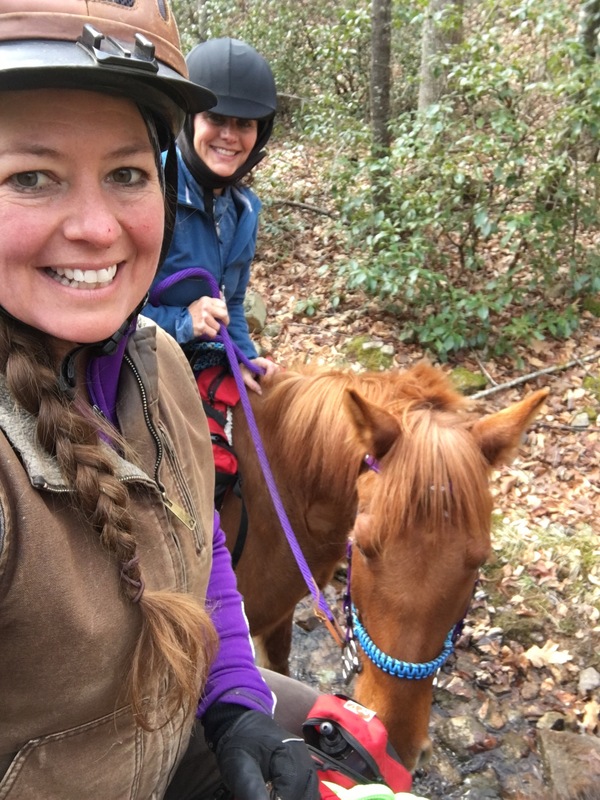 Being a wild mare has advantages- she is amazing in the woods like she’s lived there all her life (she was wild on the range for her first 2 years which is a major plus). realize other animals live out here too and you don’t need to worry (check). I am amused reading back to an earlier post where I mentioned there were some basics that are good to have in place before trailer loading. Which one had I neglected? So here we are. I love to look at these steps like a creative puzzle to solve- how can I get her working toward what I want in a way that doesn’t force or cause her stress: we always keep the relationship as the center. It’s a puzzle for me to create a puzzle for her. As Buck would say- you sort of set it up for them and let them do it. We created a hay hallway to walk her through in the barn so she can begin to feel closed in but still have an escape route. She’s ok with that so far and we also back out of it without (too much) trouble. Eventually the hay hallway will be taller and closer in and then we will not walk all the way through but close the door and have her be ‘ok’ in the small space. I’m not into horses working for their food or using treats to train. Doesn’t mean I think no one should but it isn’t generally in line with what I am trying to do. 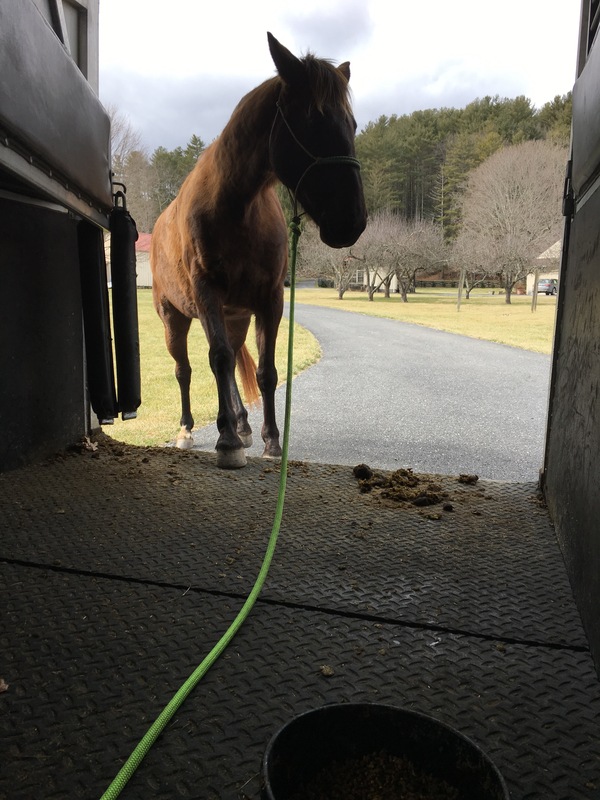 That being said I starting looking creatively at how to get her comfortable on the trailer and decided in her case feeding her there might be a multi-prong solution. Most importantly food on the trailer has made getting on the trailer ‘her idea’. I will always believe this is best practice if you can find a way. Today I didn’t ask her to load at all. I put her food right inside the ‘box’ and she walked up and took a few bites. Then I asked her to back off the ramp and moved the food in a few inches. She was dying to get back up there. I let her come up and take a few more bites then backed her again. Moved the dish a few more inches. She came right up but now had to stretch a little more. She still was willing but it wasn’t as easy. Back up – once more. I put the bowl in the center. This means she really can’t reach it without two feet inside the box. I believed this was harder for her to accept but not too much pressure for her to work out. Then I got in the trailer and watched. It was fascinating to see her WANT to get on the trailer but feel like she wasn’t sure she could handle it. It put me in a different role- one that helped her instead of forcing. Now it was a puzzle that she could solve and I watched her work it out. Sometimes she came up and ate for about a minute or two. Then she’d back off – I always allowed her to back off but she would step right back to the edge. Her mind was in the trailer. At one point she started looking to the outside sides of the trailer – instead of not allowing it I watched her. She was right that the food was ‘right there’ but inside the box. She was sorting out the puzzle. No – there wasn’t a way to get the food from either side. After some exploration there I helped her out by showing her once again where the food was and she did come back up. Heart through the trailer window. We were done when she finished the bowl. Half way in was all she really could stand so I’ll take it today. She worked out the puzzle and faced her fears which became less important than breakfast each time. And she couldn’t be too stressed out while she was eating which leads to the other positives to this method in her case. Eating keeps her head lower while focused on the food bowl- lower head usually means lower adrenaline. Also if she can eat while on it she can begin to relax and stay longer without realizing she should panic. If I had to load her and force her on to save her life I could do it, but I don’t chose that as the way to get her willingly loading and working together with us. It’s amazing to me how quickly force can destroy a human-equine relationship with a lot of damage to repair over a long time. And by force- it depends on the horse to define it… each horse has a different threshold and it doesn’t take what humans consider abuse to be equine force. This is why learning to really read each horse is so important to me. I still miss a lot but it’s what makes the difference between success and struggle. By the way Khaleesi is also being fed on the trailers ‘off’ side right now to make her able to load as easily on the left as the right. As for Susan’s solo ride, I am pretty confident that will be soon. Heart is frequently separated from the herd and is basically ok with Susan as her leader. One of these hand walks Susan will just hop on and feel right about it. As for the electric pen, there is a small strand in the field right now blocking their favorite corner. Mid month I plan to cross section the field in prep for spring grass and these should at least give her the chance to understand the e-fence. Next will be to set it up in the farm (safe zone) and introduce her as an enclosure and see how she does. Other mustang owners say this wasn’t an issue for them. The horses are so smart they tend to get it quickly and as long as they have food to munch are pretty content to be still and relax. I think we’ll be ok here too. On the trail she’s doing great. She’s willing and calm, relaxed and forward. We extend her ride each week and did about 6 miles Wednesday. 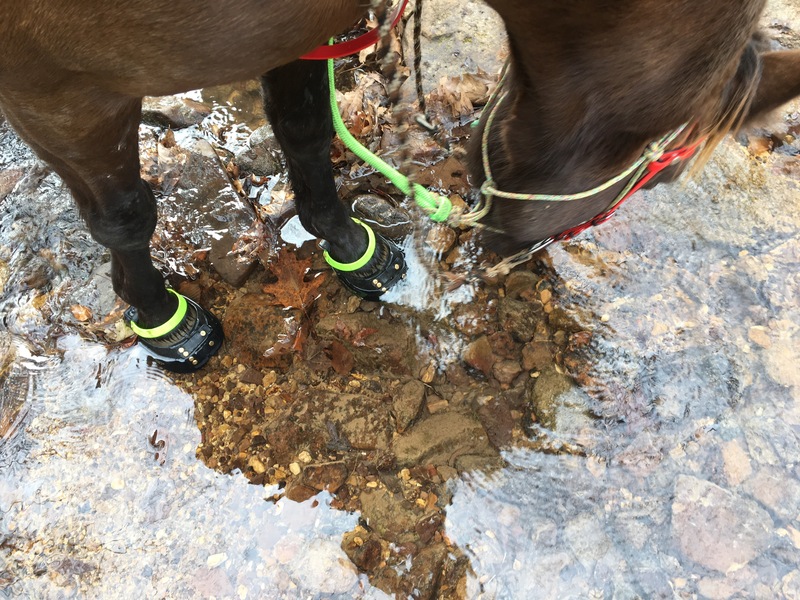 We’ve been adding some trot intervals so by next month she should have no trouble doing a pretty flat 13 miles at walk-trot with a group of intro riders. So really it comes down to the trailer. I can’t know yet how she’ll progress. She tends to be willing and smart and learn quickly but this confinement is worrisome for her which isn’t as simple as being a quick learner. We will have to see. It will happen in its time- by the end of the month or not I can’t say! 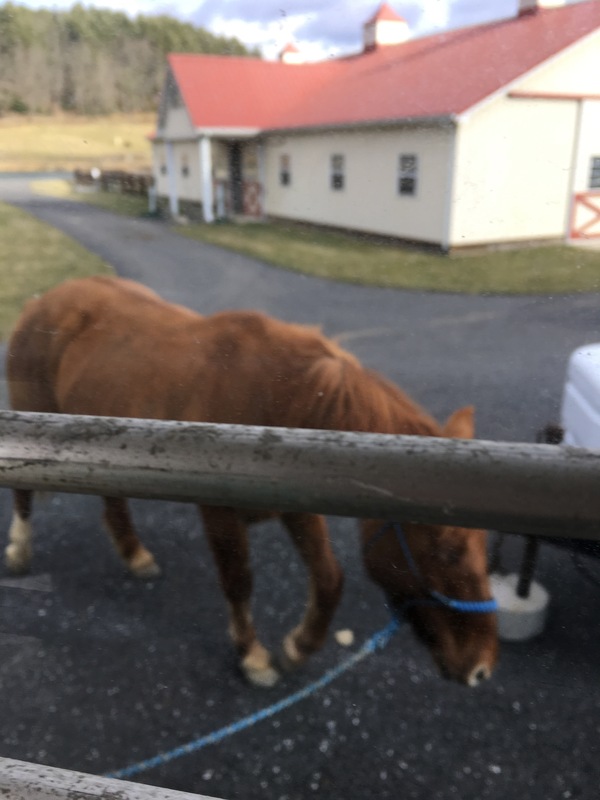 I think it is fantastic you are feeding in the trailer. Anything you can do to create positive association and have it be a good place to be. 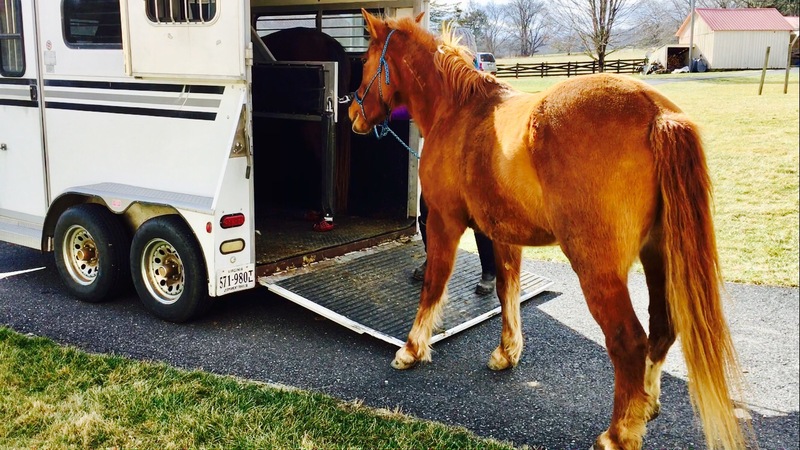 I have a trainer friend that untacks his colts in the trailer as one more way to make it a good thing.